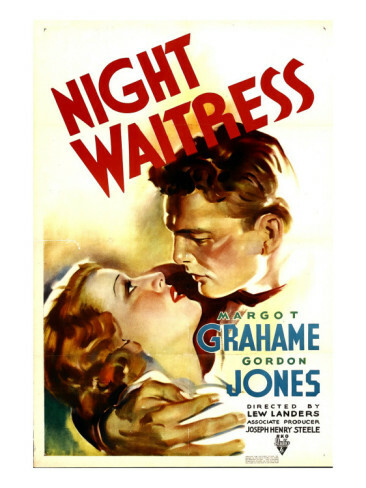 The fifth film viewed in this week's Lew Landers "B" movie festival was NIGHT WAITRESS, an entertaining crime film set on the San Francisco waterfront. This is a nice little movie which runs a lightning-fast 57 minutes. It's by no means a great film, but I found it a pleasant way to pass the time. One of the things I enjoy about "B" movies is seeing what a particular film is able to accomplish within the confines of a "B" budget and production values, and in this case one of the film's best attributes is the great waterfront atmosphere. The seafood restaurant run by benevolent Papa Torre (Billy Gilbert) is a beacon of warmth and light along the foggy docks. Grahame and Jones intrigued me simply because I don't believe I'd ever seen either of them as romantic leads. 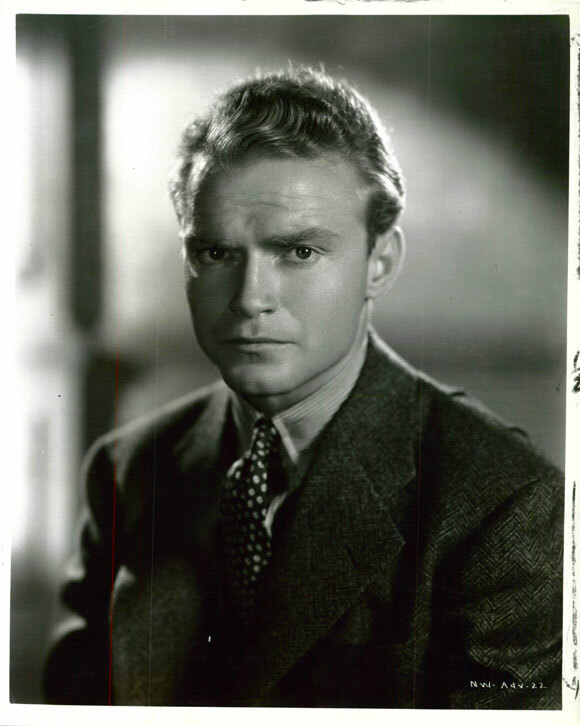 I know Jones from various supporting roles, including MY SISTER EILEEN (1942) and a couple of MAVERICK episodes, while I'm not familiar with Grahame at all. I just recorded her in TWO IN THE DARK (1936), the original version of TWO O'CLOCK COURAGE (1945), so I'll have another opportunity to see her soon. Jones veers toward the obnoxious at times, and the hard-edged Grahame wavers between a U.S. and British accent. (I also found her Harlow-esque fake penciled eyebrows a bit distracting!) However, the actors' imperfections made them interesting, simply because they're not your run-of-the-mill cookie cutter lead characters. They kept my attention start to finish. There's also the fun of a young, unbilled Anthony Quinn wandering through several scenes as a gangster. This was Quinn's fifth credit; his next film was SWING HIGH, SWING LOW (1937) which I saw a few weeks ago. Don "Red" Barry plays a man the gangsters are after, and Vinton Haworth meets his end in a nicely staged moment when he tries climbing out a window. Otto Yamaoka, Marc Lawrence, and Paul Stanton are also in the cast. You can also spot Willie Best exchanging a few lines with Jones. The movie was filmed in black and white by Russell Metty, who won the Oscar for SPARTACUS (1960). NIGHT WAITRESS was just Metty's second credit. There are some good shots, especially one filmed through an aquarium in the restaurant. 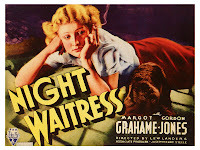 NIGHT WAITRESS is not available on DVD or VHS, but has been shown on Turner Classic Movies. Films directed by Lew Landers which have previously been reviewed at this site: FLIGHT FROM GLORY (1937), THE MAN WHO FOUND HIMSELF (1937), DOUBLE DANGER (1938), SKY GIANT (1938), SMASHING THE RACKETS (1938), TWELVE CROWDED HOURS (1939), STAND BY ALL NETWORKS (1942), and THUNDER MOUNTAIN (1947). I am constantly amazed to see how a nice quick running time and a low budget can make a film seem morel appealing. "Night Waitress" doesn't sound half bad and I look forward to catching it one day. Thanks again Laura. Margot Grahame has a significant role in The Informer as Gypo's prostitute friend and as Milady De Winter in the 1935 Three Musketeers. Not a good film but of interest because of Grahame's sensuality and Max Steiner's excleent score. A fun film despite good actor Walter Abel's dreadfull miscasting in the lead. Laura, I have this read to record on my DVR, and I'm looking forward to it. I know what you mean -- these movies don't have to be great to be enjoyable. I really liked your information about the lesser-known actors in the movie, and your heads-up of some things I'll watch for. Nice article! Great to hear from fellow fans of the "B's"! I find it such fun exploring these relatively little-known films and discovering what they have to offer. Thanks for the info on Margot Grahame, Barrylane! You've been a great help on background bios this week. It's interesting that Grahame and Abel were in THE THREE MUSKETEERS -- I haven't seen that version -- because he's also the leading man in the film TWO IN THE DARK, referenced in my post. I like Abel a great deal but do have trouble imagining him as D'Artagnan! Thanks to you all for your feedback, and I'd love to hear thoughts on this when you see it! Thanks Laura. I am happy to participate.